Manzanita is a woody evergreen shrub and member of the heather family. It is characterized by by smooth, deep red bark, thick green leaves and crooked branches. 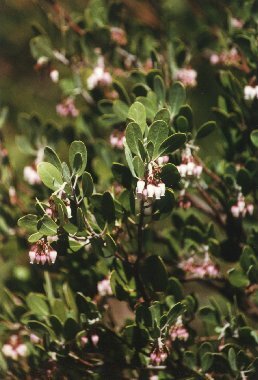 Manzanita is commonly a key component of chaparral (semi-arid regions characterized by low woody plants and scrub). Manzanita is Spanish for "little apple" a term which describes its fruit. Manzanita typically grows between 4000' - 8000' feet in elevation and may reach heights of 6'. In the spring, the plant blooms with clusters of many small, pink, bell-shaped flowers. The flowers often attract hummingbirds and insects. The plant is not browsed by animals, however, the berries are eaten by birds, rodents & bears. Native Americans used the berries for food and for making a beverage.